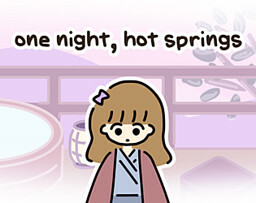 This is a walkthrough for the “One Night, Hot Springs” all-ages visual novel by npckc, available over at their itch.io page. One Night, Hot Springs has 7 different endings available, including 2 each with Erika and Manami respectively. You’ll need 4 save slots to follow this guide. Every ending you unlock also has a little after text available through the gallery button on the main screen. So be sure to check those out. …If they have reserved baths.